It seems to me common knowledge that Charles Finney was ordained as a Presbyterian minister, but I had never heard that Billy Sunday was as well. Apparently Sunday was ordained in 1903. He died this day in 1935. Read more at This Day in Presbyterian History. 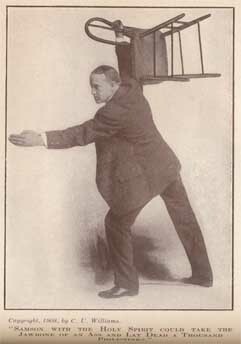 This entry was posted in Billy Sunday, Charles Finney, evangelicals, History, Irony, Outhouse Quick Hits, Prohibition, Revivalism, under-confessionalism. Bookmark the permalink. The Awakenings wreaked havoc on Presbyterianism. Sunday was from my hometown of Ames, Iowa. I thought you were going to say Jason Stellman! Rube, I play guitar and would love to join your rockin teenage combo – The Awakenings. We can play songs like “I come to the garden alone” and other Evangelical hits that feature “me, me, I, I, I” – all the stuff that I’m doing for Father God.